APARAJITA, a signature program of OP Jindal Community College in collaboration with Jindal Power Ltd, CSR & Local Government, is transforming rural India through village-based masonry training for vulnerable women. The construction industry is the second largest and fast growing employment sector in India, currently estimated at 34 million people; women comprise a significant percentage of the workforce. Women overwhelmingly, however, work as helpers - the lowest level of unskilled labor on construction sites. - Train rural women to world-class, skilled masons to meet the demands of the construction sector like Masonary,Plumbing,Electrical etc. focusing on quality, safety, productivity, and the latest technologies and techniques. -Develop technical, social, and life skills resulting in the formation of a women’s cooperatives/Self Help Groups poised to take on masonry contracts needed to improve the quality of life of rural communities. -Change mindsets about women being skilled masons for social and economic change. -Empower women to be agents of change in their communities. -Partner with local leadership for value added government schemes. APARAJITA women are selected based on their interest in working as a skilled worker. A monthly training stipend is provided to participants who are the primary wage earners of their families. Stipend amount is based on program attendance and progress on achieving skills standards and expected outcomes. 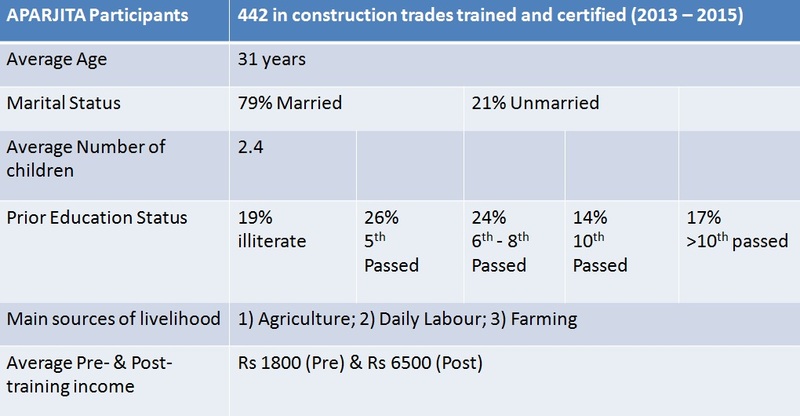 APARAJITA building India by changing the face of skilled, technically competent masons! Impact:- At present, 82% of Aparajita construction trainees are working.